The large coach pulled up onto the driveway and, in a short while, disgorged its load of noisy tourists into the uncharacteristic Speyside sunshine. Their goal? A visit to the Glenfiddich distillery, home to the world’s best-selling single malt whisky. “We’re getting somewhat less of them now ever since we raised our prices,” mused Fergus, the distillery guide who was bringing us around, as he squinted from the bright sunlight while looking in their direction. In fact the most basic visitor’s tour used to be absolutely free but recently the distillery had to charge £10 per head. To make up for the additional cost the William Grant & Sons-owned distillery also provides a couple of additional drams of whisky at the end of the tour – including the highly awarded Glenfiddich 12 Year Old and its increasingly rare 18-year old sibling – aimed directly at delighting those enthusiasts. The visitor’s tour at Glenfiddich starts off in a rather posh auditorium where one is treated to a short documentary film, created by famous Hollywood director Ridley Scott, on the whisky distillery’s humble beginnings. Glenfiddich is Scottish Gaelic for “Valley of the Deer”. When William Grant first founded Glenfiddich in 1887, he probably never have dreamt that his whisky would one day grow to become one of the world’s favourite Scotch whiskies. Grant, who had learned the art of distilling at the Mortlach distillery, uprooted his entire family including seven sons and two daughters and planted them at Dufftown in the glen of the River Fiddich (a tributary of the mighty River Spey) and proceeded to build his distillery by hand. Total cost of construction was £800, of which £120 was used to buy two second-hand stills from the Cardow distillery (which today is known as Cardhu). Its first drops of spirit was produced on Christmas Day of 1887. And while his sons continued the family business – excepting one rebellious spirit who joined a competing distillery – Glenfiddich’s global rise started in fact with his son-in-law Charles Gordon, who was married to his daughter Isabella. Gordon, who was the company’s first ever salesman, spent the year of 1909 travelling to many parts of the world including Australia and the Far East with their whisky and putting Glenfiddich on the world map across five continents. His trunk, the very one that carried the bottles of precious liquid accompanying him around the world, still sits in its pride of place in the distillery’s private family room amidst other similarly precious artefacts. The distillery’s long term global view would serve it well. For example, the infamous Prohibition in America of the 1920s and early 30s didn’t quite hurt Glenfiddich as it did many others which had to close down – in fact the distillery responded by increasing its capacity. Glenfiddich was also the first distillery to consistently export single malt whisky (before that it tended to be blended whisky), first to England and then the United States in 1963. It’s also the first single malt in 1963 to be sold in an airport travel retail shop, and the distillery was also first to open its doors to the public by opening a visitor centre in 1969. Which explains the busloads of tourists still arriving on a bright summer’s day in 2015. After visiting the stills that produce the new-make spirit that will later go into different barrel types for aging, Fergus then brings us to see Glenfiddich’s duty free warehouses, the low hanging buildings in which barrels upon barrels of precious liquid sit quietly to age over the years. 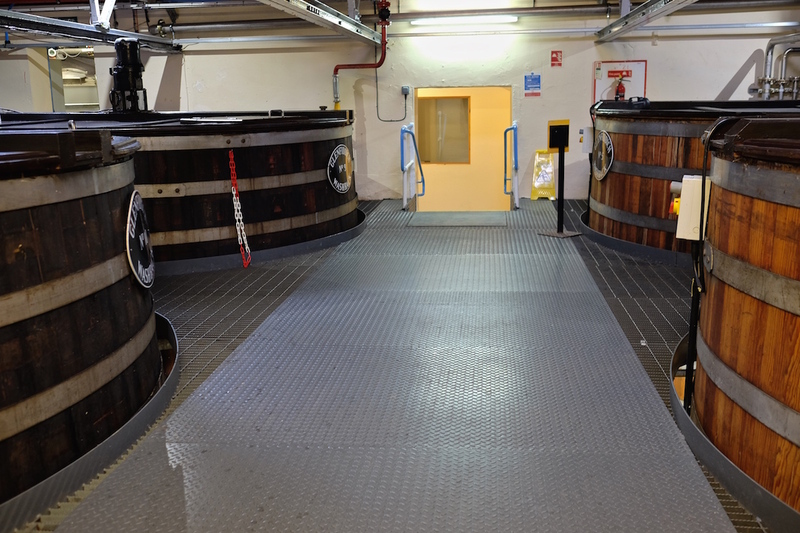 In Warehouse No.8, we spy the massive vat which employs the Solera process to marry the liquids that would go into the making of the Glenfiddich 15 Year Old (YO). “We used to allow visitors to taste the whisky directly out of the Solera vat, but we’ve stopped that ever since someone posted themselves doing so on social media,” Fergus explains rather regretfully, as we peered into the vat as Glenfiddich malt master Brian Kinsman would have and breathed in the rich notes of pear, oak and sweet spice. “The excisemen weren’t happy about that, so that was that.” We ached for a taste. Behind us, a gaggle of American tourists gasped loudly as a burly warehouse man deftly emptied a number of barrels at the same time. The bungholes of each barrel were expertly rolled into position, and the contents of each spewing forth as a golden stream into a stainless steel drain that led into the storage tanks to be ready for bottling. The sight filled everyone with awe, also because it dawned upon us that we were witnessing many tens of thousands of dollars worth of whisky gurgling past our feet. 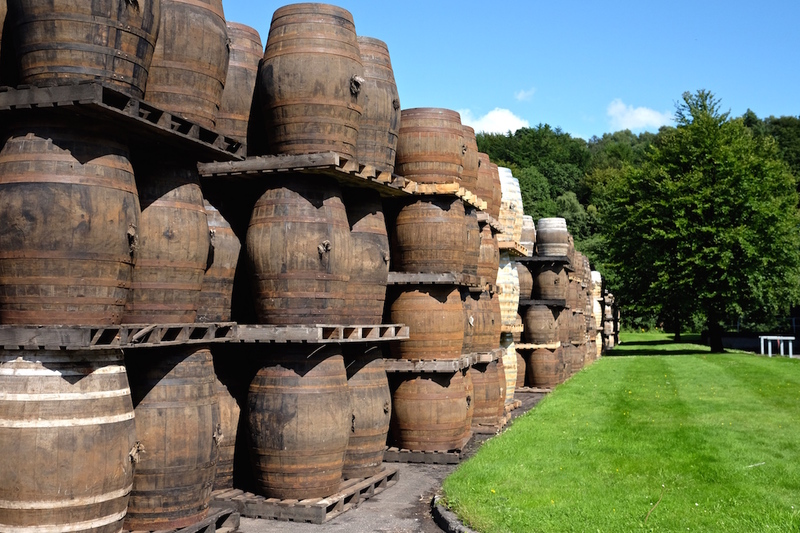 Then we got to see a part of the distillery that most visitors to Glenfiddich don’t get to see – the on-site cooperage. About a kilometre away from the main gaggle of buildings that make up the distillery sits a rather separate building. “You’re probably only the second group I’ve brought to see it this year,” Fergus says. But what gets you about that innocuous structure is that it’s almost entirely surrounded on one side by a veritable wall of barrels. Here master cooper Ian McDonald oversees a team of seven coopers and two apprentices who examine and patch up every single barrel that comes into the distillery. 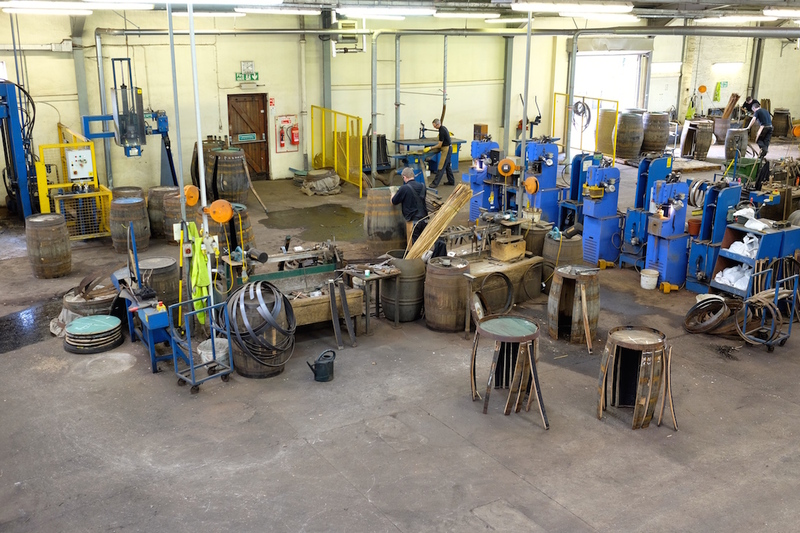 Most distilleries these days outsource this portion to shared cooperage works, but it is obvious Glenfiddich believes it is important enough to keep this skill set alive to invest in their own cooperage. 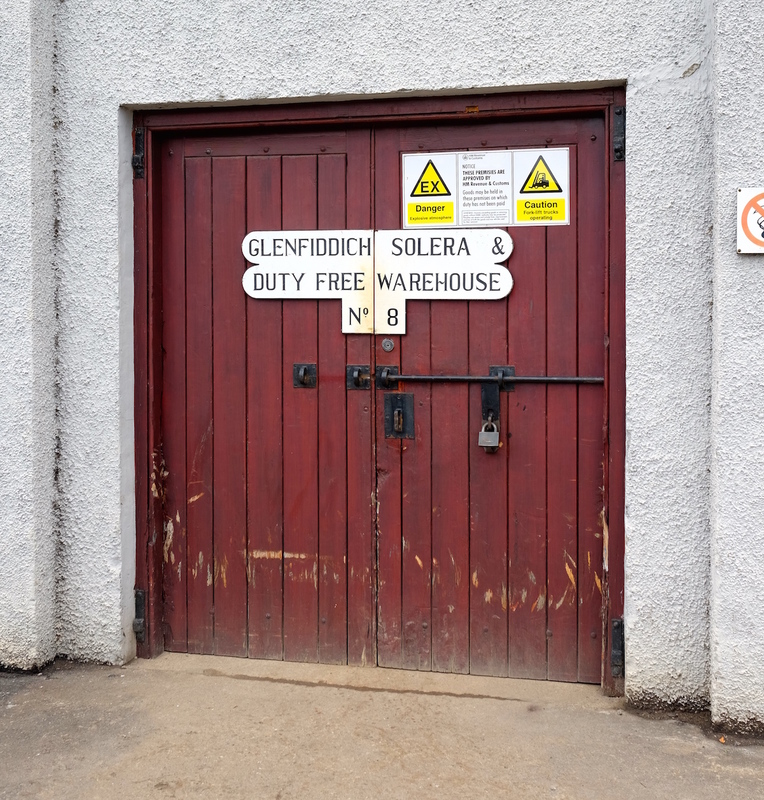 Unlike at most other distilleries where barrels are rendered into their component staves before shipping, Glenfiddich’s wood policy sees them buying their barrels whole. The coopers inspect each barrel, and in some cases pull them apart and fixing them back together again, to make sure there aren’t any leaks. Those that are beyond hope are salvaged for parts. It’s hot, heavy, and hard work – and far too underrated and unappreciated. Traditionally the warehouse men get the best taste of the whiskies they make during the production process. The coopers, on the other hand, get the literal dregs. Sometimes barrels come back into the cooperage with some liquid left in them, and the coopers salvage those last few drops that’s usually far too tannic to be truly enjoyable. But they’ll likely need the liquid encouragement anyway – outside sits that wall of barrels, stretching almost a mile, waiting for their fine ministrations. Back at the main building, the crowds throng the gift shop as well as Malt Barn, the on-site restaurant. 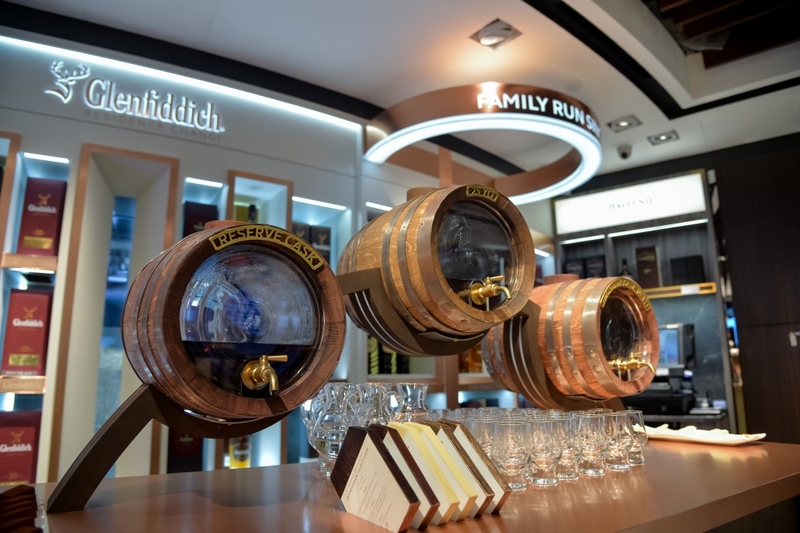 It perhaps a sign that the Glenfiddich brand has truly entrenched itself into the whisky drinker’s pysche, in part thanks to its proliferation across drinking establishments as well as travel retail shelves at airports worldwide. It’s truly a staggering operation – at around 10 million litres a year Glenfiddich is one of Scotland’s largest distilleries, with its many stills labouring around the clock to meet global demand. But at the heart of the distillery that makes the world’s best selling single malt whisky is still a family operation, one that’s persisted into its fifth generation. Old William Grant would be hard-pressed to recognise the distillery as it currently is, much of which has been changed since his day. But he would have approved of seeing the twelve-pointed stag – which didn’t exist during his time – on his bottles that’s available in around 200 countries worldwide today. The Glenfiddich distillery is located at Dufftown, Banffshire AB55 4DH, United Kingdom. We thank William Grant & Sons for arranging this special visit.